In the unlikely, if not highly improbable event of Biafrans remaining in the British inhumanity and graveyard called Nigeria in the next ten years from today, Nigeria will force Biafrans out of Nigeria by themselves because they cannot match our global successes in every sector. 1. We have taken over the industries. 2. We are in firm control of everything called commerce, home and abroad. 3. We have taken over education. In all the Universities in Nigeria, after the indigenous people, next in population is Biafrans. In our own Universities, we are more than 95% in population. 4. We are doing excellently in all of the Universities in the world, where Biafrans are found, and you can hardly find any institution where there are no Biafrans. Some Biafran men and women are lecturers in Chinese Universities, and many universities across the globe. 5. What of Doctors and medical personnel? In the US, UK, Germany, in fact, all over Europe and America, Biafrans are doing more than can ever be communicated in writing. 6. In WAEC, NECO, JAMB, NYSC, our States set the standards, despite their criminal and atrocious quota system. You can ask the school proprietors and proprietresses, WAEC, JAMB, NUC, NYSC, NECO, HOSPITALS, CHAMBERS OF COMMERCE AND INDUSTRY, NSE, etc. 7. In every Biafra home, you cannot see any boy or girl that is not in school. Conversely, among the Yoruba, at age of 5 to 10, they are scattered in Mechanic Villages all over Nigeria, while Hausa Fulani are deployed to the hinterlands as herders and menial jobbers, where they are converted into instruments of islamization and terrorism. How can they contain and match the Biafra global achievements in 10 years from today, and contend with the whirlwind that our explosive ingenious developments will represent? I do not even want to talk about the entertainment industry, such as music and movies. What about sports, such as football and others? Biafrans are in firm control of all those areas without any tinge of competition from anywhere, and that excellently. Even the media that used to be the exclusive monopoly and pride of the Oluwole forgers called Yoruba, Biafrans have completely taken that over, courtesy of the internet which birthed the social media, rendering the Yoruba insignificant, irrelevant, and almost silent, leaving the Yoruba to be gasping for air of survival, almost in futility. What more shall we say? 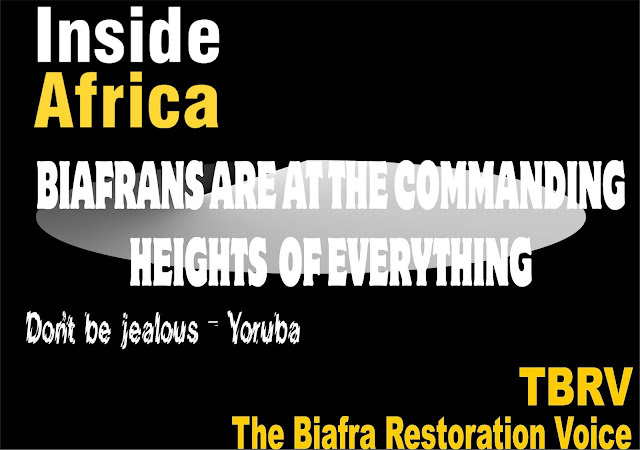 Even though the victims of British brutality, inhumanity, and ruthlessness, who call themselves citizens of Nigeria, especially the Oluwole forgers known as Yoruba, and the nomadic barbarians, terrorists, and savages known as Hausa Fulani, know that Biafra is their sustenance, and so are pathologically afraid of the dissolution of the fraud called Nigeria, they equally know that with the uncontrollable momentum of the Biafra creative, inventive, entrepreneurial, and ingenious explosion, if they do not facilitate the peaceful exit of Biafra, they will be assimilated by Biafra, bringing them into total extinction, in no distant time. This is the bitter truth.